Over the past few years, I have come to learn that I can always rely on Alan Gratz for a powerful and compelling middle-grade/teen novel. I loved both Code of Honor and Projekt 1065 on audio and was moved by both stories of boys in unusual circumstances finding uncommon strength to do the right thing. 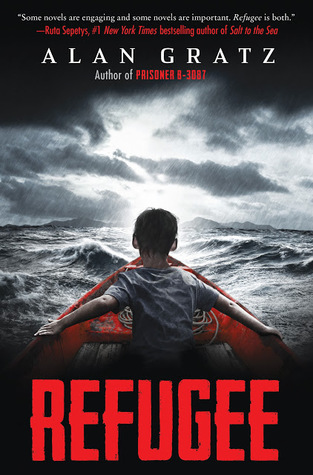 Gratz has done it again with Refugee, with a slightly different twist: this novel features stories of three different children, all refugees, holding up under horrible circumstances during three different periods in history. Josef is a twelve-year old Jewish boy living in Nazi Germany in 1938 when a group of Hitler's stormtroopers burst into their small apartment one night and drag his father off to a concentration camp. The family has already endured being moved out of their home, and his father lost his law practice. When his father is released from Dachau six months later, it is with the condition that the family must leave Germany within two weeks. They set off with a few belongings in suitcases and board a ship set for Cuba, which is said to be accepting Jewish refugees. In 1994, a young Cuban girl named Isabel is already starving from food shortages when she is caught in a riot in town one day. Alarmed, her parents want to take steps to keep the family - including the unborn baby in her mother's belly - safe. When Castro announces a brief period where Cuban citizens may flee without repercussions, they set off in a tiny boat packed full with their family and their next-door neighbors, hoping to reach Florida and new, free lives. And closer to the present, in 2015, Mahmoud is a young boy living in Syria. His city is already torn apart by civil war, but when a bomb actually hits their apartment building, leaving it open like a dollhouse, Mahmoud's family must flee. Hearing that Germany is accepting Syrian refugees, they set off toward Europe on foot, planning to cross multiple countries by multiple means to reach their destination. The novel alternates between these three engrossing stories, as each family encounters massive challenges - bombings, storms at sea, drownings, thievery, and more - just to try to find safety. This clever interweaving of three stories set in three different time periods brings the current refugee crises into perspective: these are not new problems. Each story is suspenseful, action-packed, and poignant on its own, but taken together, they are even more powerful. As you can see from the brief descriptions, the locations of each refugee crisis are linked cleverly - the place that is the problem in one time period becomes the refuge in another, which makes these stories even more thought-provoking. Be forewarned that, as you might expect, the children in all of these stories are in serious peril, and there are not happy endings for every single character, so this might be best for older middle-grade readers and teens. The author pulls everything together at the end with some historical notes about the parts of the stories that were based on fact (most of it, even some characters). This brilliant novel combines engaging and effective stories that shine a much-needed light on a significant issue in our world today; this novel should be required reading for everyone - young people and adults alike. Listen to an audio sample here. The three different narrators really bring these moving stories to life. Or order Refugee from Book Depository, with free shipping worldwide. Oh, great, Helen! It is truly a remarkable novel with 3 amazing stories - I wish everyone in our country would read it!